Newcastle manager Alan Pardew has said Magpies fans have now seen the best of Rob Elliot after the goalkeeper defied Maritimo in their Europa League draw. United's group phase campaign kicked off with a goalless stalemate, and the former Charlton player, 26, weighed in with crucial saves to earn a point. "Rob was terrific in goal," Pardew told BBC Newcastle. "If the fans have seen the game tonight they have seen the reason we brought him to the football club." Elliot worked with the Magpies boss during Pardew's spell at Charlton, where he made 109 appearances in all competitions. 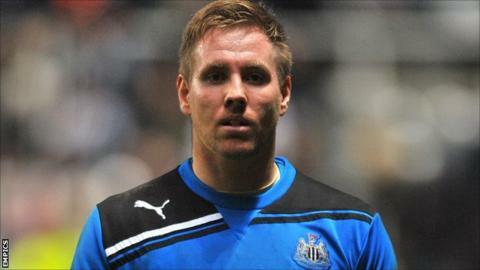 His Magpies debut in September 2011 came in a League Cup tie against Nottingham Forest, which was won 4-3 in extra-time. He played for the Republic of Ireland Under-19 but is yet to win senior honours. Elliot was brought into the side in the absence of Netherlands international goalkeeper Tim Krul, who picked up an elbow injury while on international duty. Meanwhile Thursday's trip to Portugal marked only a second Magpies start for the former Republic of Ireland Under-19 international since his move from The Valley in August 2011. "All our players will be delighted for him," Pardew continued. "In training we know he's brilliant, he had one game at Forest where he wasn't at his best and he's been reflected on in that performance. "I hope the fans see most of that tonight, because within 20 minutes we could have been 2-0 down if it wasn't for him - he was terrific, and he was solid for the rest of the game." The full interview with Alan Pardew after the Maritimo game will be broadcast on BBC Newcastle's Total Sport show on Friday, 21 September - and is available on the iPlayer.